Hubbell Pop-Up Receptacles for countertops provide a power source ideal for kitchen and bath counters and islands. 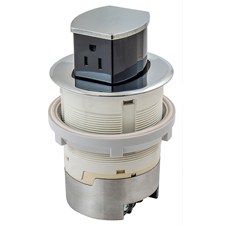 Hubbell is the first to market a countertop receptacle that is UL Listed. It allows compliance with NEC® 406.5(E) [countertops], 406.5(F) [work surfaces], and 406.5(H) [seating areas]. Pop-Up Receptacles are tested and water resistant to a half gallon spill. The receptacles feature Hubbell’s patent pending silicone gaskets and patented cam action tamper-resistant technology. Seven finishes are available in surface or flush mount options to match any décor.